Careers | John Canning & Co.
Careers at John Canning & Co.
John Canning & Company understands that the key to success is a collaborative team effort. 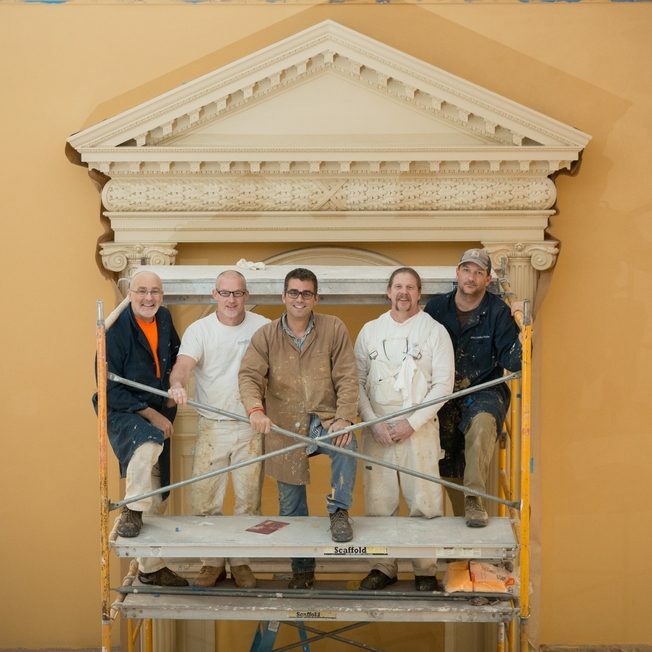 We pride ourselves on creating a positive and successful team-oriented environment that encourages our craftsmen and conservators to problem solve, develop, and expand their skills to produce their best work. With projects across the US, we are always looking for new members to join our team. If you have a passion for preserving national landmarks and historic building interiors, apply today! We are looking for energetic, creative, and intuitive thinkers that are as excited as we are in Perfecting Preservation. Function & Scope: The conservation technician will perform conservation of fine art murals and artwork for various landmark and historic building interiors. Conservation will take place in-situ or in studio, depending on the scope of work for the mural itself. Examine artwork using magnification, specular, raking, and ultraviolet light. Document artwork conditions in prose and use established condition report templates. Carry out required treatment for conservation based on assessments and reports. This includes but is not limited to: stabilization and conservation of delaminating paints, application of protective facings, application of protective coating(s) sprayer or by brush as appropriate and to ensure adequate coverage, conservation inpainting, canvas relining, canvas repairs, preparation of plaster or other substrate for artwork, limited consolidation of plaster, etc. Coordinate and carry out photo-documentation as needed. Provide treatment reports and documentation, as required. Working as a conservation technician, the work will be executed in large team projects either in our studio or in the field on various job sites. The conservation technician will gain experience on a broad range of projects and materials from different periods. If you are passionate about the conservation and preservation of national historic landmark interiors and artwork, then apply today! One to three years related education, training, and/or experience. Read and interpret documents such as conservation documentation, safety rules, operating and maintenance instructions, safety data sheets (SDS) and procedure manuals. Use Microsoft Office to write and prepare routine reports and correspondence. Problem solve, collect data, and document information. Be comfortable working in a construction environment and make responsible judgements about workplace safety. Effectively communicate verbally and maintain effective working relationship with supervisor, staff, and other co-workers by contributing to a positive organizational culture based on mutual respect, collegiality, collaboration and openness to many perspectives. Climb ladders, lift up to 50 lbs. and stand for long periods of time. Ability to multitask is critical. Please include a letter of intent detailing experience, resume, contact information, and references. Function & Scope: The laborer will perform many tasks that require manual dexterity, hand-eye coordination, good physical fitness, a good sense of balance, and an ability to work as a member of a team. Distribute building materials to the appropriate location according to project plans and specifications. Tend machines; for example, they may mix sand, plaster using a portable mixer or tend a machine that pumps cement, sand, plaster, or stucco through a spray gun for application to ceilings and walls. Ability to use small tools and power tools related to general construction. Will assist plasterers and woodworkers in all aspects of their skilled trade. If you are a self-starter and a team player, then apply today!